Provide comfort for the family of Betty Deel with a meaningful gesture of sympathy. Kingsport, TN - Betty Jean Dales Deel, 80 of Kingsport, TN went to be with the Lord on Monday morning, April 8, 2019 at Holston Valley Medical Center in Kingsport, TN. Betty was born on August 15, 1938 in Harmon, VA. She was the daughter of the late Noah and Dicey Raines Dales. She was a longtime member of the Old Regular Baptist Church and was a strong believer in her faith. She was loved by her family and all that knew her. In addition to her parents, she was preceeded in death by her sons, Steven Jene Deel and Barry Keith Deel and a daughter, Amanda Kaye Deel. Survivors include her husband of 63 years, Lando Deel; daughter, Pam Deel (Jeff) Cantrell; grandchildren, Kimberly Sue Deel, Jessica Cantrell, Jeffrey (Monica) Cantrell, Sarah (Jordan) Towler, Steven (Shayna) Coleman and Emily (Henry) Coleman; great grandchildren, Ayden Al-Ameri, Rylan Cantrell and Addie Mae Cantrell; a sister, Audrey Dales Yates, a brother, Benny Dales and several nieces and nephews. Funeral services will be conducted 11:00 a.m. Thursday, April 11, 2019 at Little David Old Regular Baptist Church, 1093 Bear Branch Road, Vansant, VA 24656 with Elder Danny Yates and Elder Buster Mullins officiating. Burial will follow in the G.W. Deel Cemetery, Haysi, VA. Pallbearers will be Jeff Cantrell, Jeffrey Cantrell, Steven Coleman, Jordan Towler, Mark Deel and Stoney Deel. The family will receive friends after 10:00 a.m. prior to funeral service. Online condolences may be sent to www.haysifuneral.com. 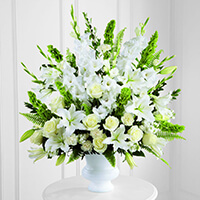 To send flowers in memory of Betty Jean Deel (Dales), please visit our Heartfelt Sympathies Store. Tim Jenkins sent flowers to the family of Betty Jean Deel (Dales). With deepest sympathies. May God bless your family. Tim Jenkins purchased the The FTD Morning Stars Arrangement for the family of Betty Deel.